Is your audience getting lost during your big presentation? The issue might be in the clarity of your presentation agenda. Learn 5 creative ways to provide a clear and memorable agenda to your presentation. Why should you have an agenda slide? When you have a clear agenda, you not only tell them what your presentation is about, but also tell them how you will cover the topics. Your audience needs this assurance right up front to stay with you for the rest of your presentation. An agenda helps your audience to orient their thoughts at the opening. It makes your message memorable. When you don’t have an agenda slide, you leave your audience clueless. As humans, we always want to know our location and position. It is wired to our survival instinct. That is why big malls have maps, lifts have floor indicators and large parks have guides. 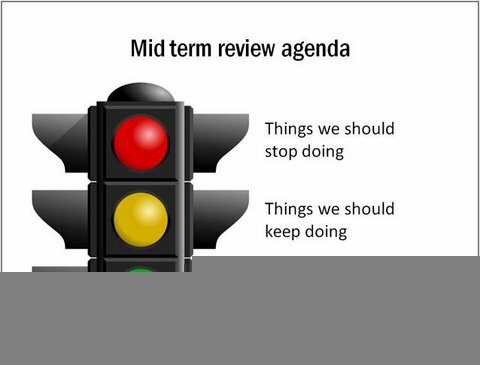 A good agenda slide serves as a guide post for your presentation. 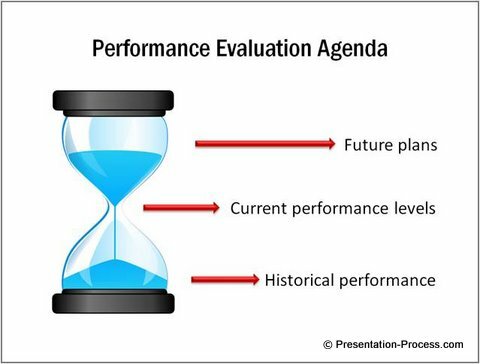 After you finish every point in the agenda, repeat the agenda slide to show your audience what is covered and what is left to be covered. Use your agenda slide to help your audience from getting lost in your sea of thoughts. Its also a great place to summarize the presentation. quickly. Your agenda slide need not be dull and boring. Remember, the main objective of an agenda slide is to give your audience a big picture view. So, go ahead and be creative in using metaphors and analogies to orient them to your presentation. Here are some creative examples of presentation agenda. We’ve seen some boring sales report presentations brought to life by creative contextualization of data. 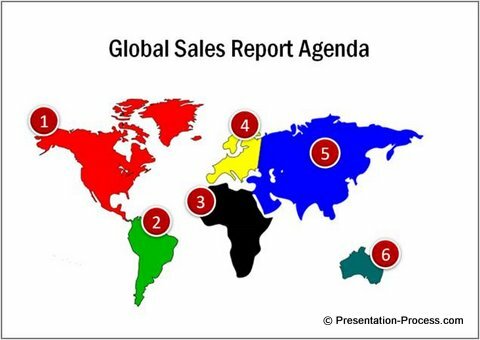 The example you see above, explains the global sales performance by continents. The slide gives a clear picture of the order in which the data will be presented and the logic behind the order. In this example, the gears not only give an overview of the three stage process, but also give the relative importance of each stage. 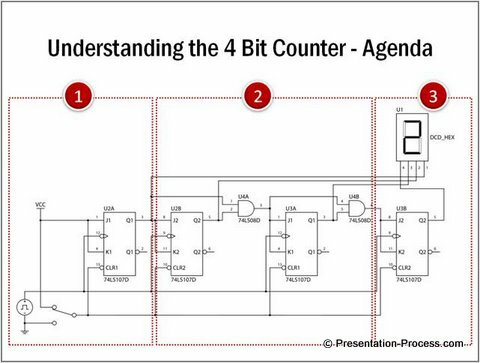 In this example, the presenter used the actual picture of the 4 bit counter to show how the content is chunked. This picture can serve as a memory hook for the rest of the presentation, as the presenter covers one segment after another. The presenter used the metaphor of an hour clock to take the audience through a timeline. The intelligent use of the image makes the audience understand how the various parts of the presentation are related. In this example, a traffic signal is used to highlight the importance of various tasks. Everyone knows the significance of the different colored lights in the signal. That common knowledge is transferred to the agenda slide to talk about the tasks that need to be stopped, continued and increased. The above examples can set you thinking on how you can bring your agenda slides to life. To have an agenda and not to follow it in your presentation is seen as lack of professionalism. We’ve seen so many presenters make this mistake and leave the audience disappointed. Remember, an agenda is a promise you make. 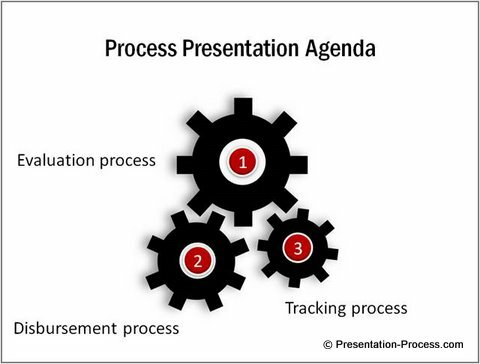 By covering all the points in your presentation agenda, you fulfill that promise. It makes you look credible. You leave a strong cue in your audience’s mind that you have the discipline and commitment to follow through your promises.